Emergency preparedness is about individual responsibility. Disasters like floods, tornadoes, fires and winter storms can overwhelm a community very quickly. Planning ahead can help you and your family recover more quickly should disaster strike. Find out what types of disasters are most likely to happen in your area and how to prepare for each. Find out what kind of warning sirens or signals your community uses. What do they sound like? What should you do when you hear them? Get a NOAA All-hazards Alert Radio. Remember, when you’re indoors, you may not hear outdoor sirens. Create an emergency plan for your family. Quiz your kids every six months to make sure they know what to do. Conduct fire escape drills. Post emergency numbers by phones. Teach children how and when to call 9-1-1 for emergency help. Show each family member how and when to turn off utilities. Learn to use a fire extinguisher properly. Install smoke detectors on every level of your home, especially near bedrooms. Test detectors monthly and change the batteries at least once a year. 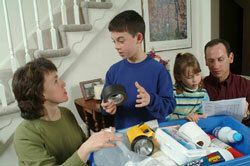 Stock emergency supplies and assemble a disaster supply kit. Take first aid and CPR classes.